The Trinity Game by Sean Chercover, a Mysterious Review. Review: Father Daniel Byrne works for the Vatican's Office of the Devil's Advocate, an investigator assigned to authenticate miracles among the faithful. He has yet to confirm one. When he disproves the miraculous claim of a child's stigmata in a politically sensitive region of the world, one important to the Church, his superiors reassign him out of the field. 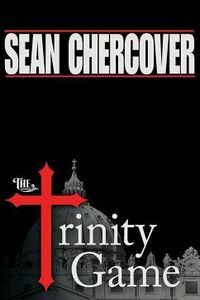 But he's given one last chance to redeem himself in The Trinity Game, the first in a planned trilogy of thrillers to feature this character by Sean Chercover. Byrne's estranged uncle, Tim Trinity — a name he adopted himself — is one of the most successful evangelists in the United States. Be generous with him, he says, and God will be generous with you. They believe and he has amassed a fortune as a result. Through the years he has used any number of effective "parlor tricks" to convince those that doubt, but his latest has even Byrne puzzled: in the middle of sermons, he will suddenly and inexplicably start to speak in what some might call "tongues", but is actually English spoken backwards. When replayed in reverse, the words are clearly understood. With the exception of a few simple words or phrases, scientists say it isn't possible to train the brain to do this consistently, and yet it appears to be effortless for Tim Trinity. But what is most troubling to the Catholic Church — and more than a few others — is that when he speaks backwards, what he is saying is predicting the outcome of future events. And his accuracy rate is astoundingly high. Dangerously high for some. The Trinity Game has an intriguing premise and tends to carry through on developing a strong storyline to support it, but it seems as if it was all originally created for, and maybe even drafted into, a very different book, and then later modified for, and inserted into, the present framework, for which it does not quite fit. To be sure, the plot is devised in such a manner that the characters could be of any profession, and the setting could be of almost any time or place. That's very creative. And yet, it still doesn't quite work here. The main character is probably best illustrative of why. He had a conflicted childhood that has carried forward into his adult life, but he's been able to channel his inner strength — and at times physical strength — to deal with it. He's engaging, intelligent, ambitious, resourceful, and exceptionally good at what he does. But he never comes across to the reader as a priest, let alone a high ranking one within the worldwide organization of the Catholic Church. Good character, right man for the job at hand, wrong — or at least not terribly credible — profession. If one can get past this structural element of the book — and it's a pervasive one, so that's no easy task — they will be rewarded with a well paced, nicely crafted thriller. Acknowledgment: Thomas & Mercer provided an ARC of The Trinity Game for this review.